Beat the milk and Nutella till well blend. Pour into popsicles and freeze till done. For serving, pop the popsicles into hot water for 30 seconds and pull out. Enjoy!!! just love this pops…i want one pls…???? I am sure this is treat for the lil ones. They must hve loved it. which kid can no to this!!! love it..me too! Rafs u r definitely tempting me everyday on making ice creams!!! 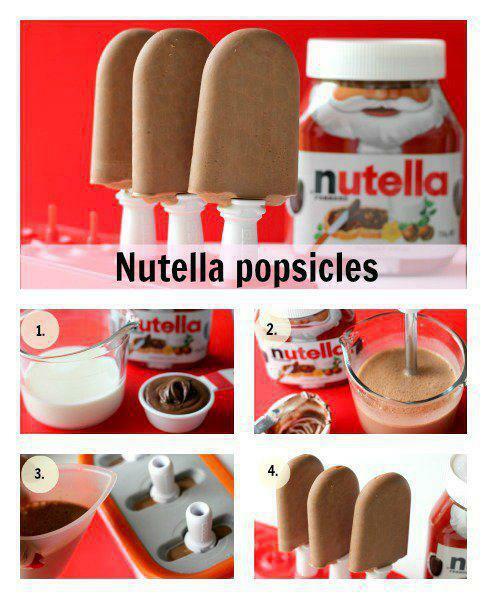 Feel like relishing this summer beauty,droolworthy pops..
NUtella is definitely not for kids only,and sometimes we need to make this kinda delicious popsicle and hide them from the kids! haha. Bookmarked! only two ingredients and a drool worthy ice pops dear 🙂 loving it !! Very tempting n easy recipe and nice post. My God,punishment for me..feel like having one..I mean craving Rafeeda. Cool and refreshing pops…Nice clicks.. Interesting recipe! The click makes it more tempting & yummy!!! I'm stalking you Rafeeda :)) Too many good ideas, here. And I love how versatile it all is- nutella iced- another way to enjoy this very guilty pleasure of mine.